The bishop has provided a ‘priest to Mass attendance ratio’ of 1:427. Looking at our current ratios for the Crawley Deanery as a whole, we will see from the breakdown in the tables that follow that this pastoral area does in fact have a priest to Mass attendance ration of 1:431. There are, however, deviations above and below this ratio, that if left unaddressed, will begin to cause difficulty as we move closer to 2030 and the forecasted ratio of 1:737. 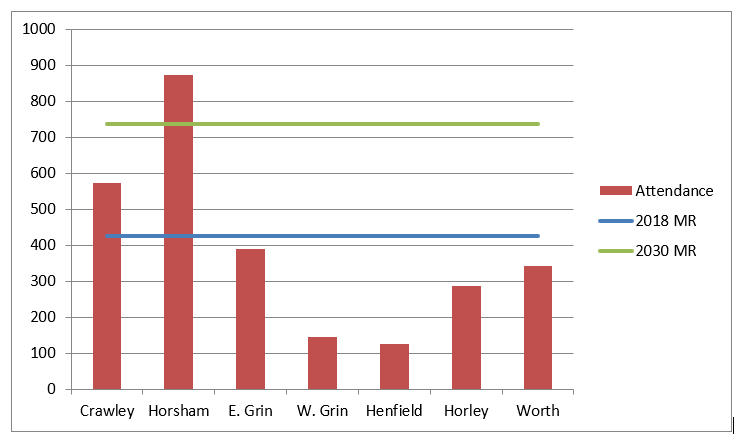 For instance Horsham currently has a ratio of 1:873, whereas Henfield and West Grinstead have the lowest ratios of about 1:135. Perhaps before we speak of 2030, there needs to be a consideration as to whether there needs to be a balancing out of the pastoral provision and a serious deanery wide consideration of the Mass provision so that each priest is saying each Mass for a steady and healthy average number of people. A ratio of 1 priest to 427(2018) or 737 (2030) are exceedingly good ratios, but it is only helpful to speak in ratios if that priest, having celebrated his 3 Sunday Masses, has been able to celebrate Mass for at least that number. The more Church buildings we have to serve the harder it is for a priest to celebrate 3 Masses for anything like 737 people; this is certainly true in the Crawley Parish which fragments its Mass population over six centres. As the ratio of priests to Mass attendance increases to 1:737, the mathematics suggests that a priest would need to celebrate each Mass for about 250 people. Ideally there would even be centres where the priest celebrates his three Masses for significantly more than 737 people, so that some Mass centres can continue with smaller congregations or because that priest has other chaplaincy or diocesan obligations. What is the purpose of the weekday Mass? The devotion of the priest and the devotion of the faithful? To give working people an extra chance to attend Mass? To facilitate Requiem Masses for the faithful? Missing Questions from the Consultation? We have 42 Deacons in this diocese; in what ways do they play an important role in the life of the diocese? Many parishes still have parish sisters; in what ways do they play an important role in the life of the diocese? NB: the further a priest has to travel it reduces both the number of Masses he can celebrate as the travel time must be included in the ‘transaction time’ for how long it takes to celebrate a Mass; and it reduces his availability for other missionary activity. If we were starting the Diocese with 25 priests where would we put them? Current Deaneries might then become the new parishes. We understand that in 2030 there will be still be 25 priests over 65, but we must acknowledge that by 2040 they will also be retired. These Retired Priests still offer valued ministry, but in fairness to them we cannot take them for granted and as such we do not plan our operational resource on retired priests, but hope that they are able to offer supply. If we are resourcing the diocese with 25 priests then the Crawley Deanery may only have 2 priests by 2040. Where would Masses be celebrated in 2030? The Crawley Deanery potentially has a mega Church at Worth Abbey (although it is currently non-diocesan – which would have many administrative and financial issues to unpick). If Worth could be utilized to its full potential it would greatly take the strain off other communities and allow Masses to be celebrated in smaller more rural centres where transport links are less reliable. This assumes that people would travel to Worth, but if there are too many local Churches nearby the incentive to use the mega Church might be reduced. The largest centres of population would seem to be Crawley, Horsham and East Grinstead, but even in these centres of population the seating capacity is not extensive. What could be done to extend, re-build, re-model these Churches which would be realistic in terms of Parish and Diocesan finances? This model would most likely see the end of small satellite Churches of these urban parishes. In this model, there would always be a Mass in the Urban Centre, and then Mass(es) moves around the existing satellite communities. The People would need to check the newsletter, bulletin board, website to see where the Mass is each week. The Diocesan 201t returns in the new directory says that there are 126 Churches, 12 Chapels and 1 non-Catholic Church. If there were 25 priests celebrating 3 Masses (in 3 different venues) each week, then the maximum number of Churches that could be sustained is potentially 75 if Mass is to be celebrated in the same churches each week (though the “French Model” would allow otherwise). The danger of speaking of 2030 is that this might reduce the sense of urgency. There will need to be a step change towards 2030. What immediate changes should be made in 2018 / 2019? Are there any Churches not viable today? Are there any Masses not viable today? What are the intermediate changes (towards 2025) that should be made? What further changes are needed to make sure that 2030 plans are ready by 2028? This entry was posted in Letters and tagged Bishop Richard, Mission of the Church on January 25, 2018 by eastgrinsteadcatholicparish.